"Despicable Me 2" movie quotes bring all the laughs of the animated "Despicable Me" characters back for more action in this sequel. The 3D adventure comedy movie produced by Illumination Entertainment was written by Cinco Paul and Ken Daurio and directed by Pierre Coffin and Chris Renaud. "Despicable Me 2" hit theaters on July 3, 2013. 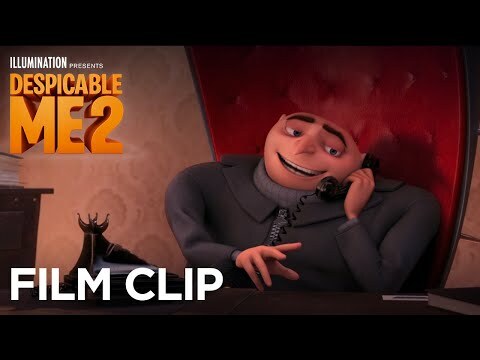 In "Despicable Me 2," Gru (voiced by Steve Carrell), his children (voiced by (Miranda Cosgrove, Dana Gaier and Elsie Fisher) and his minions are back following the happenings of the original film where Gru changed from villain to hero in order to set a good example for his daughters. 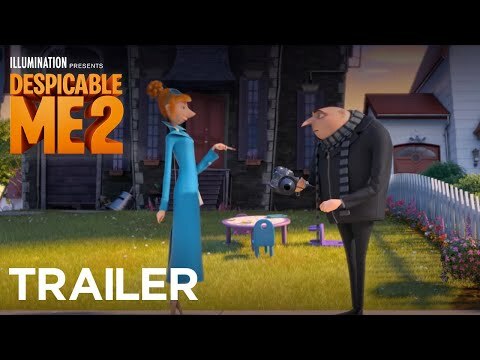 Gru is recruited by Anti-Villain League agent Lucy Wilde (voiced by Kristen Wiig) for an undercover job as a spy, kidnapped and taken to their underwater secret headquarters. At first, Gru wants nothing to do with his former life and turns down the job but eventually he gives in and joins the Anti-Villain League to help take down a new super criminal. Along with some help from Lucy and his minions, Gru uses his inside knowledge of crime to track down and take down the enemies. Other "Despicable Me 2" characters are voiced by Russell Brand, Benjamin Bratt, Ken Jeong and Steve Coogan. For something a bit more grown up, the July 4, 2013, movie lineup includes many other great movies such as "The Internship," "After Earth," "Fast and Furious 6," "Oblivion," "Admission," "The Incredible Burt Wonderstone." Lucy Wilde: "Mr. Gru, Agent Lucy Wilde of the Anti-Villain League, you're gonna have to come with me." Lucy Wilde: "You know you really should announce your weapons after you fire them. For example… Lipstick taser!" When Lucy Wilde arrives to recruit Gru, Gru has other plans and whips out a weapon. Lucy counters, easily since he announced his attack ahead of time, and overpowers Gru into submission. Gru: "Good night, Edith… Good night, Margo… Whoa, whoa, hold the horses. Who are you texting?" Gru: "Avery. Huh? Avery? Is that a girl's name or a boy's name?" Gru: "No. No, it doesn't matter unless it's a boy!" Agnes: "I know what makes you a boy." Agnes: "It's really smooth. Sometimes I stare at it, I imagine a little chick popping out… Peep-peep-peep." Gru: "Good night, Agnes. Never get older." When putting his children to bed, Gru faces the realities that his girls will grow up before he knows it. Margo already is scaring him with her possible texting to boys while Agnes scares him in her possible understanding of anatomy, something she actually does not understand which is a relief to Gru. Like to Go On a Date? Gru: "Hello Lucy, this is Gru. I know up to know our relationship has been strictly professional and you're leaving for Australia and all but, okay, here is the question. Would you like to… to go out on a date?" Gru: "Okay, that's not helping. All right, here we go, for real this time. I can do this!" [to telephone] "Gah, I hate you!" Gru practices what he'd say on the phone to ask Lucy out on a date. When it comes time for the real thing however he finds burning the phone with a flamethrower as an easier alternative. This however creates more problems, mainly in the crew of firefighting Minions that appear to put out the flames. Silas Ramsbottom: "We are the Anti-Villain League, dedicated to fighting crime on a global scale. A new villain has surfaced. You know how a villain thinks. That's why we've brought you here. I am the League's director, Silas Ramsbottom." When Gru and his Minions meet Silas Ramsbottom, the leader of the Anti-Villain League, the Minions soon make what is a serious and tense conversation into a gigglefest and all it took was the mention of the word bottom.